Title: Keepin It Frosty (Photography-.35mm & Photoshop C.S.6-Digital Art-Pentax K-1000 & Canon EOS T3i) Location: World of Music-Syracuse NY. DESCRIPTION: I created this photo while working on a rap artist’s E.P.K. (Electronic Press Kit). 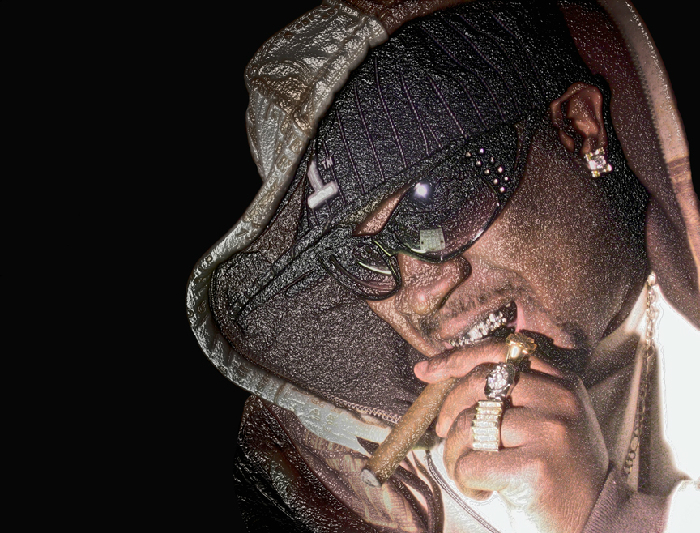 His name was Runnamuck and he was a rap artist/Hip–Hop audio engineer/business owner/& produced his own Hip-Hop T.V. program in Syracuse NY. In this photo my goal was to convey the Bling and the showmanship of Runnamuck’s style. He was always dressed to the 9’s, and his obsession with having all of the newest apparel before anyone else did inspired this theme. I created the lighting to look like The Charlie Rose Show’s lighting, where everything is blacked out except the person in the interview. I truly wanted to bring all the attention to just him so I eliminated the background. I felt like I truly captured the essence of him in this shot. This is one of my most favorite photos that I have ever taken and then edited. It's not often when a photographer gets the opportunity to shoot someone who all ready knows how to work the spot light.